Home / Showbiz / Arjo Atayde, Maine Mendoza together in US? Arjo Atayde, Maine Mendoza together in US? MANILA — Arjo Atayde left his followers wondering whether he and Maine Mendoza are currently together in the United States. This after Atayde shared a photo of Mendoza on his Instagram story on Sunday without providing when and where the shot was taken. He simply wrote “save the best stop for last” over the photo as its caption. 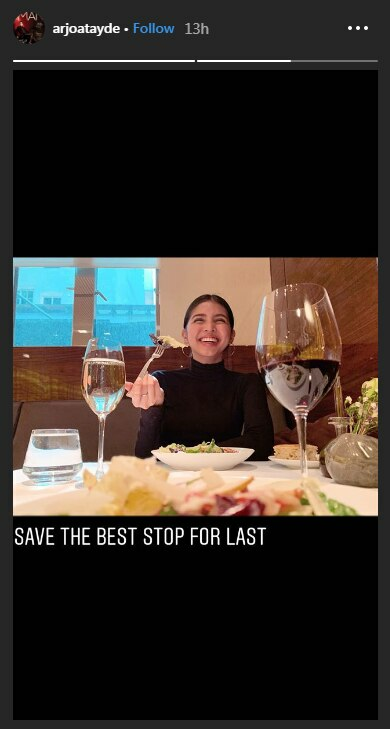 Just by looking at it, the picture suggests that Atayde and Mendoza are having a meal at a fine dining restaurant. Both Atayde and Mendoza are currently in the United States for their respective work commitments. The Kapamilya actor was in Virginia as one of Maja Salvador’s guests in her “Maja on Stage” concert, while Mendoza was in New York for another collaboration with a popular cosmetic brand. Atayde, 28, confirmed months-long speculation surrounding his relationship with Mendoza in January. Mendoza, 23, is one-half of the popular “Aldub” tandem, whose fans have had mixed reactions to their idol’s romantic involvement outside of the onscreen pairing. While some have been supportive, pointing out that Mendoza and Alden Richards can delineate between their personal and professional lives, others have gone as far as hurling insults and threats towards Atayde, as well as his family.